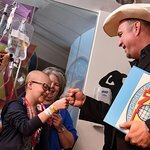 Co-founded in 1999 by Garth Brooks, The Teammates for Kids Foundation has worked with over 3,900 professional athletes from every popular professional sport to develop and implement innovative concepts that generate funds for the benefit of children’s charities. Focusing on three major areas — children’s health, education, and inner-city outreach — Teammates has passed the $100 million mark, distributing over $80 million in cash, gifts-in-kind, and scholarships and building a $25 million endowment that will ensure that the fight for children’s needs continues in the future. Teammates has accomplished these goals with one simple rule: 100 percent of the money goes to the kids. Any and all overhead costs are paid for by the board of the foundation, which is made up of Hall of Fame athletes, corporation owners, corporate officers and entertainers. With an emphasis on building Child Life Zones in hospitals across the United States and eventually around the world, Teammates has brought aid to children in more than 60 countries. Google trends for "Teammates for Kids"
We don't have any videos related to Teammates for Kids.